Regent Park Focus is a not-for-profit organization that was established in 1990 to counter negative stereotypes about the Regent Park community and provide interventions to high risk youth living in the area. We are motivated by the belief that participatory media practices can play a vital role in addressing local needs and development priorities, as well as support the work of building and sustaining healthy communities. 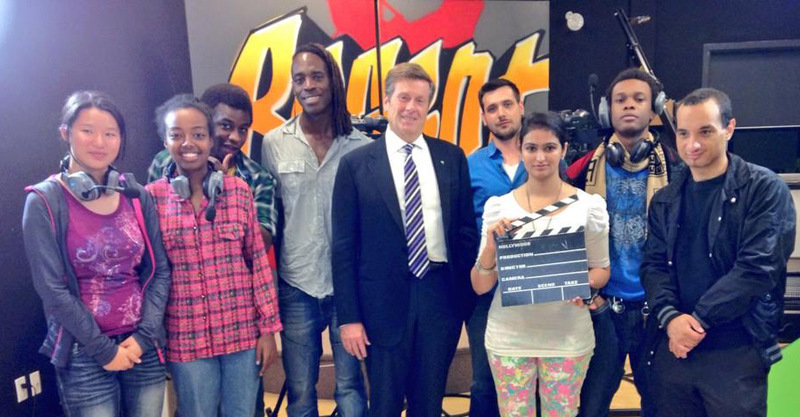 Today Regent Park Focus serves as a community learning centre for new media, digital arts, and radio & television broadcasting. We provide a community facility dedicated to the training and mentorship of young people and the engagement of community members of all ages. Regent Park Focus receives annual operating support from the Toronto Arts Council, Ontario Arts Council and Rogers Communications. Regent Park Focus was established 26 years ago, in part because residents believed that their community was being unfairly stigmatized in mainstream media. Back then, our aim was to counter the negative press by engaging young people and asking them to produce and broadcast their own print, radio and video messages about the community. Today Regent Park is going through a massive transformation into a mixed income community and no longer bears the negative stigma it once had. So what is Regent Park Focus’ new role in the revitalized community? 1. Media ownership is such that a relatively small number of corporations control what a great majority of us watch, read and hear in the media. 2. All media inherently contains value messages that express biases that shape our opinions, beliefs and attitudes. 3. Most of the media that is corporately produced is, more often than not, used to advertise, market and sell consumer goods and services to the mass market. 4. According to a 2015 report from ZenithOptimedia, Canadians, on average, consume more than eight hours of media daily. Therefore, whether it is media messaging or advertising, the fact is that we are living in a media saturated culture where we are constantly bombarded with media messages almost every waking moment of our lives. In this onslaught corporate ownership, relentless advertising and media messaging, the issue that Regent Park Focus confronts today is not how we can counter negative media about Regent Park, but how can we make media more accessible to ordinary Canadians and in doing so serve everyone’s needs to be informed citizens rather than potential consumers. At Regent Park Focus we strive to promote the idea that media broadcast communication can, if used effectively, help provide people with the information they need to make the best possible decisions about their lives, their communities, their societies, and their governments. At Regent Park Focus we are committed to media literacy and help community members understand that media in all its varied forms are based on fundamental concepts; and once an individual is familiar in the application of these concepts they are better at understanding, interpreting, decoding and deciphering media messaging. Finally at Regent Park Focus we provide community members with the tools they need to produce broadcast media and encourage them to use these tools to share their own opinions, experiences, thoughts, and ideas about what it means to live in community, not only in the neighbourhood of Regent Park but also as a global citizen. "Without a doubt Regent Park Focus remains just as relevant and vital part of the community today as it was 26 years ago!"